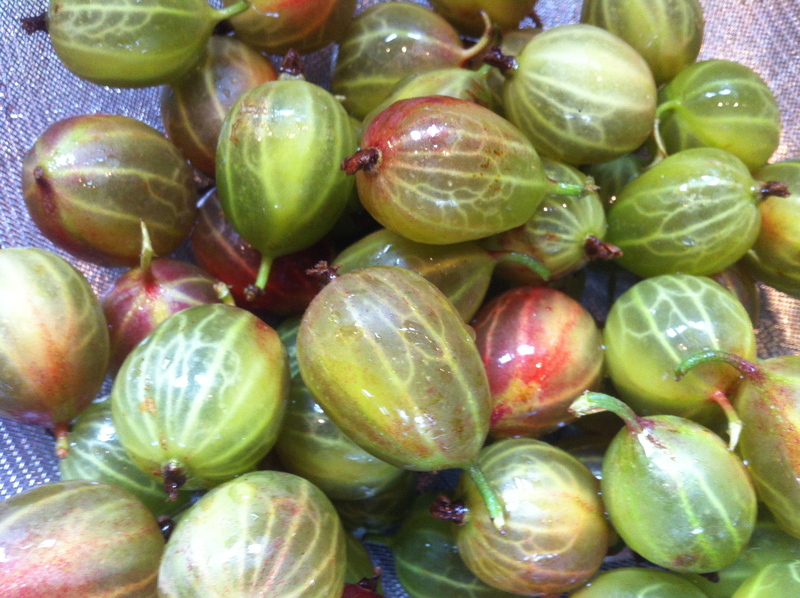 These are the gooseberries we picked this week. Quite an achievement to get there before the birds, you may remember that we didn’t net them. The crop is not large, so although Derek was favouring a pie or crumble, I thought it might be nice to prepare them simply and gently poach them in the oven. I prefer this method to stewing on the hob, the fruit keeps its shape and retains some bite. 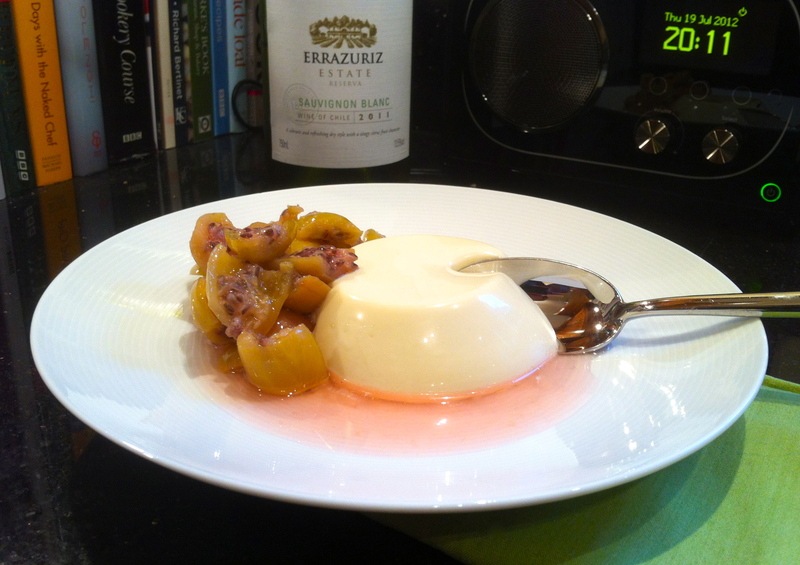 Of course you can do any number of things with the poached fruit. Thinking cool and creamy in this instance, panna cotta seemed to be just the right thing. 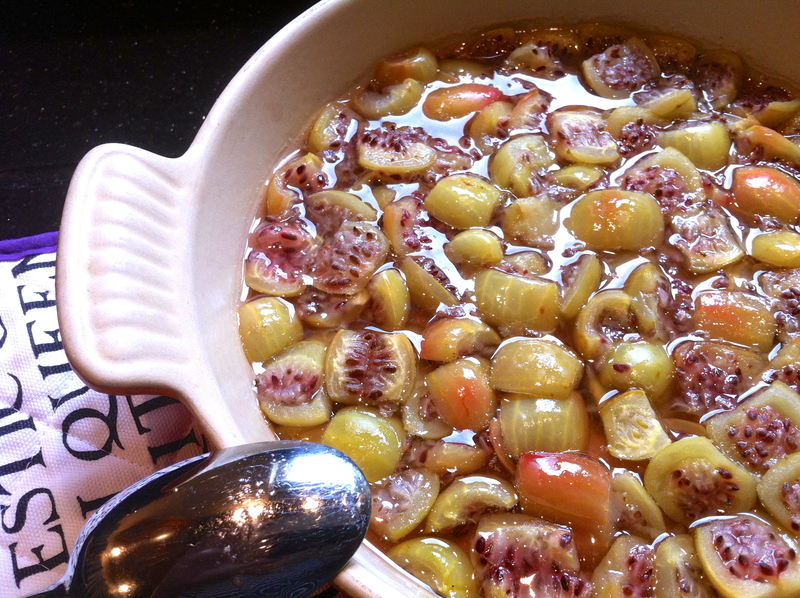 Put the gooseberries in a baking dish sprinkle with the sugar and water. Cover the dish loosely with foil and bake in an oven heated to 180 for 30 minutes. Put the cream and sugar in a saucepan and slowly bring to the boil. Simmer for 30 seconds. Remove from the heat and cool for a few minutes. Add the milk. Squeeze the excess water from the gelatine leaves and stir them into the cream mixture until fully dissolved. Add the vanilla extract. Pour into 4 individual pudding moulds which have been lightly oiled. Refrigerate for a minimum of five hours until set. To serve dip the moulds briefly in hot water and invert onto the plate. Not much of it left now!